Is This the Most Realistic Pregnancy Time Lapse Ever? We've seen plenty of pregnancy time-lapse videos—but this one truly captures the essence of those nine months, in all their gory details. And we love it. Pregnancy time lapses are nothing new. We've all seen our fair share of videos showing the experience from conception to delivery—but this latest one really shows every aspect of that experience, in adorable detail. It's not a video of a woman wearing the same black top throughout and posing happily. It's not an otherwise unchanging image focusing on a growing bump. And while those videos are incredibly beautiful and sweet, this one is something different: it's real life. Mark Sherman uploaded the video in question—he has a YouTube channel where he shares videos of his family, from travel vlogs to fun little videos showing major moments in his kids' lives (think first steps, first swims, first giggles.) A month ago he released a time lapse featuring himself and his wife, Brittany, as Brittany experienced pregnancy on camera—and the video doesn't shy away from really showing what that entails. The Shermans capture the ups and the downs of the experience in a series of about 2,000 photos that have been spliced together and set to the song "A Sky Full of Stars" by Coldplay. 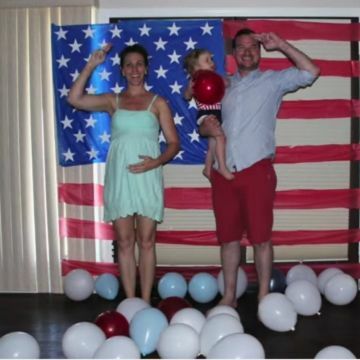 Some photos capture the pure joy of pregnancy: There's a full-on celebration when the couple learns they're expecting a girl, for example. But it also shows the side of pregnancy that's not quite as happy: In a few frames, Brittany is clearly exhausted, nauseous or overwhelmed. Other photos show the day-to-day life of a woman who is in her second pregnancy. There are shots of her feeding her firstborn, downing fast food and getting a foot massage from her partner. Oh, and there's also a series of shots that show Brittany lying down as a series of chain restaurant logos flash above her. It's an illustration of what's happening in her head and something we can all probably relate to, pregnant or not. Overall, this video is definitely worth a watch, especially if you tend to feel discouraged by the time lapses showing seemingly perfect mothers-to-be. It might not be the most artistic or avant garde video out there—but it's one of the most truthful depictions of pregnancy we've seen.